Last week Nina Dobrev who's played the character Elena (as well as what seems like hundreds of Elena dopplegangers) announced that she was leaving the show after the current season (Season 6) ends. Seemingly after every season there is some type of speculation regarding one of the big 3 of the show leaving so this should come as no surprise to fans of the series. While I do believe the show might take a slight hit in the ratings it is after all a primarily female fanbase so keeping the male leads on board should soften the blow. On top of that season six has so far pretty much taken the focus off of the Elena character altogether and replaced her with Caroline as the female lead. So does this mean it won't be watchable for guys? Not Necessarily. So far as mentioned above the character of Caroline Forbes has become a bratty kind of evil so she fangs out a lot more than she used to (which was hardly ever). 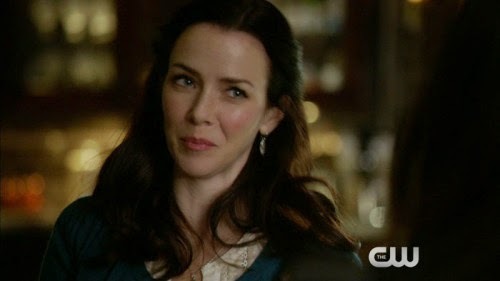 Also the Salvatores mother Lillian (played by Annie Wersching) has been discovered as one of the evil undead as well so there is hope going forward for some crazy cougar biting. Vampire Diaries airs Thursdays on the CW Network in the US. No new movie or TV show reviews?